During World War I, Ypres was the centre of intense and sustained battles between German and Allied forces. FOB is an abbreiation for Flemish OLd Brown, a classic Flemish beer-style matured on oak barrels. Barrel aged fot 2 yrs in French Bourgogne barrels, and consecutively 1 yr in US Kentucky Bourbon Barrels from the Wild Turkey distillery. The Struisse Ypres, a Flemish Old Brown ale at 7 % ABV was difficult to develop. The most tricky factor was achieving balance between malt and sour, says Urbain the Master-Brewer at De Struisse Brouwers. The recipe was wiped out many times in between trial and error !! The Flemish are renowned for their stubbornness, obstinacy and perseverance. After all of the above, Urbain Coutteneau is happy to bring you some good news too. The Struisse ‘wipers’ managed to deliver a fruity brown ale with a subtle acidity. The wonderful aromas and flavors brfought additional complexity by aging “Ypres” in Burgondy barrels for 2 years and a consecutive year in Bourbon barrels. Enjoy, but one drinks the Struisse Ypres 2009 FOB best with moderation !! 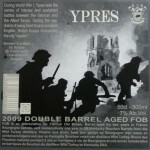 Check out Struisse Ypres 2009 at Belgiuminabox.com!